Server is slow due to high CPU usage caused by the "mysql" process. According to this KB article there are multiple slow queries. Websites that are using MySQL databases operate slow. Database dump takes too much time to complete. The MySQL server is not tuned for optimal performance. Note: Database performance tuning is out of the scope of Plesk Free Technical Support. Contact Professional Service team in order to perform this task. Note: Increasing values may affect server performance. Make sure that there is enough RAM. Connect to the Plesk server via SSH or RDP. If CPU consumption increases again, consider reviewing the SQL code of a database that has slow queries. Check the MySQL error logfile /var/log/mysqld.log for errors. Find databases that cause slow MySQL performance by enabling the MySQL slow query log. 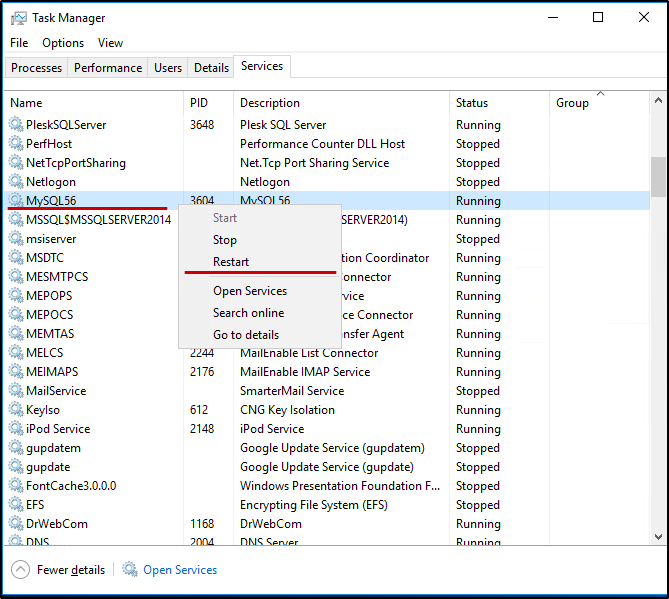 Note: For accessing MySQL in Windows, it is required to add the line skip-grant-tables right under [mysqld] in %plesk_dir%Databases\MySQL\my.ini and restart MySQL service, as it is shown above. Do not forget to remove it and restart again after all is done. Install and run the mysqltuner utility. This utility will analyze the current MySQL server instance and provide recommendations for adjusting appropriate parameters. @Hany Mesbah Gadalla, Hi! your case is being investigated in a support ticket already. Let's continue the discussion in the ticket. The problem has been solved. You have to remove the space before and after the equal sign (example below). Please update the page. @Hany Mesbah Gadalla, thanks for the note. Updated.